Our website has been updated with details of this year's Christmas stamps which will be issued on November 7th. 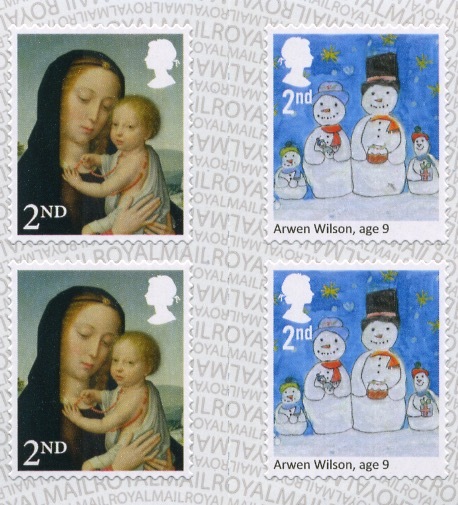 The usual rotation of subjects means that there is a religious theme this year but, as previously announced, there was also a children's design competition from which two designs will contribute four secular stamps. 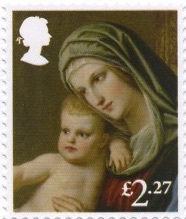 The Madonna and Child stamps are issued in 6 designs in 8 values, and the Competition stamps in two designs in four values. The miniature sheet has only the Madonna and Child stamps. Retail booklets containing 12 x 1st or 2nd class stamps contain 6 of each design and are printed on SBP2 paper (the picture below shows centre of 2nd class book). In case supplies of these booklets are insufficient to meet demand, two additional books have been printed, each containing 12 x Madoona and Child stamps. These are supplied to Royal Mail's standing order customers but may not appear in Post Office branches and retailers until much closer to Christmas. My expectation is that these will carry over to 2018 and will provide the religious alternative to the secular designs to be used next year. JG has sent another example of the mixed 2nd class booklet showing the backing paper inverted (see above). I don't intend to look for all the variants as I find that few people are interested in more than one example, but collectors who are interested know that that at least one of the booklets come in two types. To add to the cost for collectors of 'everything', there are also two generic stamp sheets. The religious one contains, as usual, just one set of Madonna stamps consisting as it does of 8 x 1st, 8 x 2nd and all the airmail stamps. Printed by International Security Printers rather than De La Rue there will be space for these in some pre-printed albums. Collectors who buy the sheet for the set of 6 stamps (no Large Letters) will at least have 7 each of 1st and 2nd to use on their Christmas Cards. The design of the sheet echoes that of the miniature sheet. The other sheet contains 10 of each of the 1st and 2nd Competition stamps, with the sheet border showing pencils, crayons and other craft materials which could be used for making greetings cards. See all the stamps and sheets, and see the technical details and source of the images used on our new webpage. We will not be stocking any of these stamps, though we may use some on customer orders. 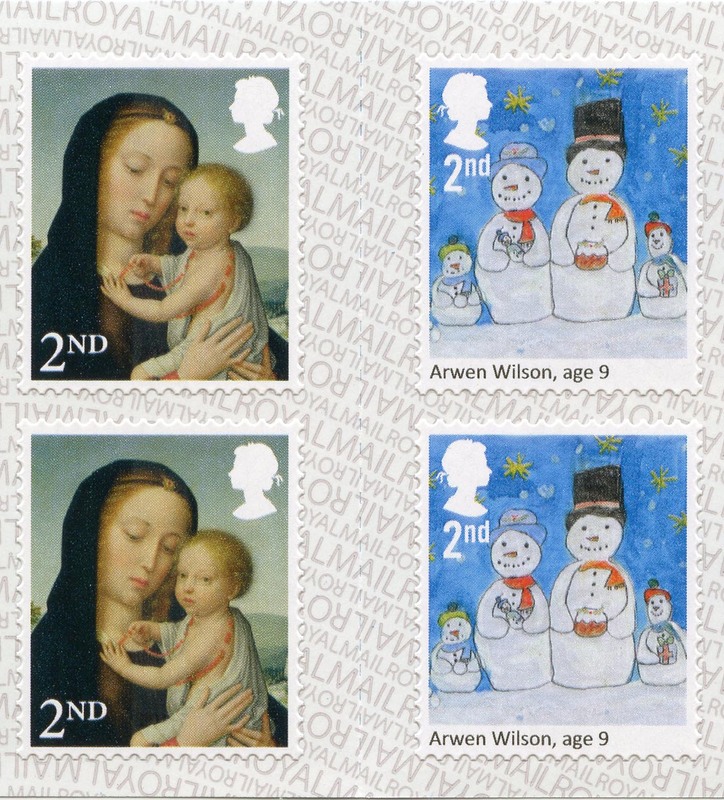 At last, two sets of beautiful stamps for Xmas. I particularly like the Virgin & Child ones. If rumours of the Queen's abdication next year are true then they will be a fitting last Xmas issue of the reign. The children's designs are sweet too. What a strange comment. Do I detect a troll? Believe it or not some people other than hardened philatelists read this blog. We do get the occasional spam but I shield you from that. I think that this is somebody who likes using stamps: no spam links are there. I suppose it is a sign of the times but in years gone by you could order additional supplies of the Christmas stamps as soon as they appeared on the Royal Mail website and you could be guaranteed they would arrive on the issue day. Sadly in the last two years that is no longer the case. I was hoping last year was a blip while they got used to the new ordering system, it appears not.